When Do We Recommend Chemical Peels? Chemical Peels or otherwise known as Superficial Peels are one of the most commonly used, most popular and most effective procedures for improving general skin appearance, and to restore skin to a more youthful appearance. A Chemical Peel will work wonders on fine to moderate lines and wrinkles, the appearance of certain types of scars, brown spots, sun damage, clogged pores, skin discolouration, dull complexion, acne scarring, rough skin, skin blemishes, blotchy skin, hyperpigmentation, age spots and freckles. In general, people with fair skin and light hair respond best to Chemical Peels. However, people with darker skin types may also achieve excellent results, after careful consultation with one of our Aesthetic Specialists. A Chemical Peel renews the skin by lifting dead cells from the skin surface and stimulating the metabolism of the cells beneath. There are several different types of chemicals used, depending on your individual skin condition, your skin type, and the desired results. The most commonly used chemicals are salicylic acid, lactic acid, glycolic acid and alpha hydroxy acid. These so-called acids are all derived from natural sources, such as sour milk, unripe fruits, and sugar cane, rather than a laboratory. Types of Chemical Peels vary from minor, Superficial Peels with little or no downtime, to more serious, deeper peels that will require sedation and some time away from work. 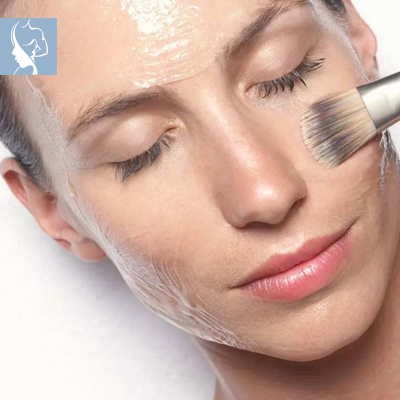 Chemical Peels can be performed on the face, neck, chest, arms, hands and the back, so anywhere you wish to improve your skin texture, with your specialist’s recommendation. People with sunburned, windburned or broken skin should wait until their skin has healed before undergoing a Chemical Peel. If you recently had a wax or used a depilatory cream, consult your Specialist on the advisable time to undergo the treatment. Pregnant women should avoid Chemical Peels, as well as breastfeeding mothers. Those suffering from oral herpes may not be suitable candidates, as the virus can spread to your healing skin. Skin will be thoroughly cleansed to remove excess oil and dirt. The peel product will be applied in layers and the skin monitored for a reaction. Once the desired result is achieved, the peel will be removed or neutralised depending on the product used. A soothing or moisturising cream, as well as a sunscreen, will be applied. Your Specialist will prescribe proper aftercare to maximise the result and to prevent any possible complication, like pigmentation changes. These might include avoiding sun exposure, as well as the regular use of cleansers, moisturisers and sunscreens, to protect against the harmful effects of the sun and environment on your healing skin. After a Chemical Peel, both redness and slight swelling are normal and may last from a couple of hours to a day or two. Depending on the kind of peel, you might experience mild flaking of the skin. Once this has subsided, you can expect a smoother and more evenly toned skin with a firmer, fresher and more youthful appearance. For best results, a course of Chemical Peels is recommended and can be done as a very effective anti-ageing treatment as often as once per month. Side effects are uncommon if you adhere to the post-treatment instructions. Prolonged exposure to intense sunlight may lead to hyperpigmentation and scarring is uncommon unless the face is scratched or picked at during healing. In some cases, slight swelling, redness, mild itching or stinging occurs, as well as mild skin scaling which usually ends between three to seven days after the procedure may occur depending on the strength of the peel.